You won’t read this entry on the subway, but you may well have read the Daily News article by Michael O’Keeffe while moving through a tunnel beneath New York City. Your ride this morning, was in a roughly 60x10 stainless steel box, which at rush hour may hold as many as two-hundred and fifty human beings. Many of you read a story of a man who had experienced sexual abuse, and if you made it all the way through, may have thought: “Not me”. I have had people tell me that they “didn’t know anyone that had happened to”. 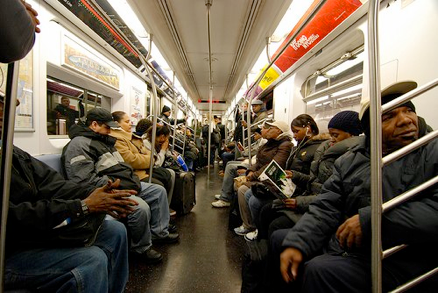 The statistics will say that approximately 63 people in your rush hour subway car had a very different reaction, from direct personal experience alone. The percentage of boys who have had unwanted or abusive sexual experiences before age 16 in America is comparable to the percentage of Americans who have blue eyes. The percentage of girls who have experienced these abuses is comparable to the percentage of Americans who have a college degree. Have you met anyone with blue eyes? Have you met anyone with a college degree? Tens of millions Americans have lived with, have lived through childhood sexual abuse. Not all of them lived long enough to earn the label of ‘survivor’. None of us, whether we have dodged this all-too-common bullet or not, have the luxury of hearing these stories as stories about ‘Them’. They are always stories about ‘Us’. This is New York City. Often we experience all of these things in a single moment of near sensory-overload. But our senses do not overload. We leave that to John Rocker on the 7. We are New Yorkers. We can handle it. We are made for it. We are made of it. The mapping of the human genome tells us that 98.77% of DNA base pairs of humans and chimpanzees are the same. The person scrolling down this page on their iPad & Ronald Reagan’s late co-star Bonzo. 98.77% the same. The Human Genome Project has also told us that, genetically, we are 60% the same as a delicious, potassium-packed banana. Yet somehow, we will look across the subway car, and see a human being that we so quickly define and dismiss as ‘Other’. The homeless man, the CEO, the migrant worker, the child in the stroller that just rolled across the tops of your feet, the owner of the elbow lodged in your ribs. Name a nationality, name a religion, name a shade, name an age, name an occupation…and try to find a way that is of any substance that goes beyond the surface to distinguish Us from Them. We all want to be happy, but struggle to find what the truly means. We all want to avoid suffering, and often mistakenly or ignorantly bring worse upon ourselves. We throw monkey wrenches into our own gears. We slip on the banana peels of ourselves. Ten-thousand joys and ten-thousand sorrows…the Eight Worldly Winds: praise and blame, success and failure, pleasure and pain, fame and disrepute…find us all in mildly varying measures. No ‘Not me’…no ’Me’…there is only ever Us. I’m reminded of a line from Fight Club “We cook your meals, we haul your trash, we connect your calls, we drive your ambulances. We guard you while you sleep.” When it comes to male survivors of sexual abuse…we are you, and we are everywhere. We are your fathers and your sons. We are your uncles and your cousins. We are your husbands and your boyfriends. We are your co-workers, your teammates, your friends. We don’t get to be ‘different’…We’ve got too much company.